Arab Momeni, M., Yaghoubi, S., Aliha, M. (2018). Optimal control of quality investment in joint venture by Stackelberg game. 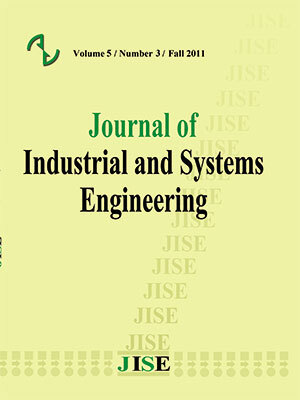 Journal of Industrial and Systems Engineering, 11(Special issue on game theory applications' in industrial engineering), 83-107. Mojtaba Arab Momeni; Saeed Yaghoubi; Mohammad Reza Aliha. "Optimal control of quality investment in joint venture by Stackelberg game". Journal of Industrial and Systems Engineering, 11, Special issue on game theory applications' in industrial engineering, 2018, 83-107. Arab Momeni, M., Yaghoubi, S., Aliha, M. (2018). 'Optimal control of quality investment in joint venture by Stackelberg game', Journal of Industrial and Systems Engineering, 11(Special issue on game theory applications' in industrial engineering), pp. 83-107. Arab Momeni, M., Yaghoubi, S., Aliha, M. Optimal control of quality investment in joint venture by Stackelberg game. Journal of Industrial and Systems Engineering, 2018; 11(Special issue on game theory applications' in industrial engineering): 83-107. In projects carried out as joint venture (JV), two or more legally independent firms form a strategic alliance to do a project cooperatively and to obtain the necessary credits asked by a contractor. Due to the wide scope of a joint venture project, partners are sometimes from different areas industrial fields or even different countries which might have different quality standards. Such differences in the quality standard result in the problem of quality difficulties which entails sufficient planning to avoid or decrease it. In this paper, a cost sharing coordination mechanism based on a two person Stackelberg game is proposed in which, the more qualified partner that acts as the leader invests in the quality promotion of the other partner who acts as the follower and the costs of investment are shared between the partners according to a contract. Based on the dynamic nature of the quality level and the investment programs, the problem is modeled as an optimal control problem for which the necessary and sufficient conditionsof the optimal solution arediscussed. Also, based on the Hamilton function of the optimal control problem, some alternatives for the path of investment are considered. Then the path which results in the best gain for the partners according to the leader-follower game is chosen as the solution of the problem.The results show that the optimal path of investment is parameter dependent so the sensitivity analysis is done to show how changes in the parameters affect the best path of investment. Badger, W. W. (1993). Alliances in international construction. Arizona State Universit. Balachandran, K. R., &Radhakrishnan, S. (2005). Quality implications of warranties in a supply chain. Management Science, 51(8), 1266-1277. Cao, Y., Mao, J., Ching, H., & Yang, J. (2009). A robust tolerance optimization method based on fuzzy quality loss. Proceedings of the Institution of Mechanical Engineers, Part C: Journal of Mechanical Engineering Science, 223(11), 2647-2653. Chao, G. H., Iravani, S. M., &Savaskan, R. C. (2009). Quality improvement incentives and product recall cost sharing contracts. Management Science, 55(7), 1122-1138. Child, J., Faulkner, D., & Tallman, S. B. (2005). Cooperative strategy. Oxford University Press, USA. El Ouardighi, F. (2014). Supply quality management with optimal wholesale price and revenue sharing contracts: A two-stage game approach. International Journal of Production Economics, 156, 260-268. Garb, R. H. (1988). Joint venture in the construction industry. The Handbook of Joint Venturing, Dow Jones-Irwin, Homewood, IL. Gavious, A., &Lowengart, O. (2012). Price–quality relationship in the presence of asymmetric dynamic reference quality effects. Marketing Letters, 23(1), 137-161. Girmscheid, G., &Brockmann, C. (2009). Inter-and intraorganizational trust in international construction joint ventures. Journal of Construction Engineering and Management, 136(3), 353-360. He, Y., Xu, Q., Xu, B., & Wu, P. (2016). Supply chain coordination in quality improvement with reference effects. Journal of the Operational Research Society. Hong, Y., & WM Chan, D. (2014). Research trend of joint ventures in construction: a two-decade taxonomic review. Journal of Facilities Management, 12(2), 118-141. Hsieh, C. C., & Liu, Y. T. (2010). Quality investment and inspection policy in a supplier–manufacturer supply chain. European Journal of Operational Research, 202(3), 717-729. Kazaz, A., &Ulubeyli, S. (2009). Strategic management practices in Turkish construction firms. Journal of Management in Engineering, 25(4), 185-194. Kopalle, P. K., & Winer, R. S. (1996). A dynamic model of reference price and expected quality. Marketing Letters, 7(1), 41-52. Leng, M., &Parlar, M. (2010). Game-theoretic analyses of decentralized assembly supply chains: Non-cooperative equilibria vs. coordination with cost-sharing contracts. European Journal of Operational Research, 204(1), 96-104. Macki, J., & Strauss, A. (2012). Introduction to optimal control theory. Springer Science & Business Media. Maurer, H. (1981). First and second order sufficient optimality conditions in mathematical programming and optimal control. In Mathematical Programming at Oberwolfach (pp. 163-177). Springer Berlin Heidelberg. Maurer, H., &Osmolovskii, N. P. (2004). Second order sufficient conditions for time-optimal bang-bang control. SIAM journal on control and optimization, 42(6), 2239-2263. Moon, I., Feng, X. H., &Ryu, K. Y. (2015). Channel coordination for multi-stage supply chains with revenue-sharing contracts under budget constraints. International Journal of Production Research, 53(16), 4819-4836. Norwood, S. R., & Mansfield, N. R. (1999). Joint venture issues concerning European and Asian construction markets of the 1990's. International Journal of Project Management, 17(2), 89-93. Panda, S., Modak, N. M., &Basu, M. (2014). Disposal cost sharing and bargaining for coordination and profit division in a three-echelon supply chain. International Journal of Management Science and Engineering Management, 9(4), 276-285. Reyniers, D. J., &Tapiero, C. S. (1995). The delivery and control of quality in supplier-producer contracts. Management Science, 41(10), 1581-1589. Sahebi, H., Nickel, S., &Ashayeri, J. (2015). Joint venture formation and partner selection in upstream crude oil section: goal programming application. International Journal of Production Research, 53(10), 3047-3061. Scaringella, L., &Burtschell, F. (2015). The challenges of radical innovation in Iran: Knowledge transfer and absorptive capacity highlights—Evidence from a joint venture in the construction sector. Technological Forecasting and Social Change, In Press. Singer, M., Donoso, P., &Traverso, P. (2003). Quality strategies in supply chain alliances of disposable items. Omega, 31(6), 499-509. Yan, X. (2015). Contract efficiency for a decentralized supply chain in the presence of quality improvement. International Transactions in Operational Research, 22(4), 713-734. Zhu, K., Zhang, R. Q., &Tsung, F. (2007). Pushing quality improvement along supply chains. Management science, 53(3), 421-436.